Today, Walmart announced its own post-paid wireless service in partnership with T-Mobile USA called Walmart Family Mobile. Walmart’s new Family Mobile service which will use T-Mobile’s network, will provide customers unlimited calling and texting for $45 per month for the first line, and $25 for each additional line. However, data and international calling will be charged from a pre-paid account attached to the family plan. For example, 1GB of data usage will cost $40 and will be pooled for the whole family, in which unused data will be carried over month-to-month. Walmart Family Mobile will provide similar features as postpaid accounts, such as the bill is paid at the end of the month. But at the same time its also similar to prepaid services as it won’t come with a contract agreement, early termination fees, or credit checks. So its kind of like the best of both worlds. Beginning Monday, Walmart will offer five handsets including the Motorola Cliq XT, which will cost $249. Agreed with our new ceo, massive plans on handset releases this year, hspa+ expansion and the (rumored) iPhone and sprint merger.. I think its time to say T-Mobile USA is not joking around anymore and wants to be Number one. IMO I hope Deutsch Telekom/T-Mobile USA/Google since google has strong ties with us Take over the Phone/Internet Thing all together in the US. Can’t say i agree with having a German based company running things in the US just because i love my country but i do believe out of the big 4 T-mobile earns the most respect with its customer and if one had to monopolize the phone industry id hope it would be us and Def not Verizon! Unlimited Text and calling for those that need to have a phone is a good price. This will appel to those that have little or no credit, but can’t get a contract phone and see Boost or other pre-paid to expensive. Your comment is silly. ‘this will appeal to those with little or no credit’ ? That is silly….I have great credit, and I would consider these plans. Very silly comment IMO. They just want people to be unlimited at a good price. You’re coming off as salty for no reason. His comment was in no way silly. I’m kinda liking where all this new stuff with partners is headed. Definitely looking up for Tmo right now. Yeap Yeap, sounds alright I suppose. But I wonder what other phones Tmo is gonna dump on Walmart that are already end of life? Lol, ehhh, you can have the cliq, enjoy. I can confirm Samsung Highlight, an old Nokia candybar style (didn’t get a good look but it was something you’d expect in a prepaid box)and Samsung Gravity. as long as T-Mo doesn’t become the next gallon jar of pickles. 40 bucks for a gig of data? Holy Highway Robbery, Batman! Let’s see, that 250 gigs I used last month at home on my DSL line would run me $10,000 if I tethered. You are definitely seeing this the way I am! While $40 a gig is a lot, for that to be rolled over and shared across an entire account is a huge change! Definitely not meant for the power user but for families….this just made smartphones affordable for everyone. I hope this data plan comes down to the stores and not just walmart. Great Job Tmobile. Keep shaking things up! Yeah, that’s not bad, actually. I have a program on my phone that keeps track of all network traffic. It was only a couple days ago I went over 1gig. That’s after 3 months with the phone. Do the math, I just paid $75/gig for my data. And yes I use it a lot. Auto update of my wallpaper from webcam every 30 minutes, download a ton of apps (I have over 100), not to mention updates. Autosync of contacts and calendar updates. I also check a lot of things online that come up on conversation. I use an online bible at church which streams through the network connection, not to mention youtube. Oh yeah, add in the fact that the price for data is shared between everybody makes it even better. Mom and dad can give the 3 kids their phones, put $40 in the account, and when the data is gone, that’s it til the next month. I wish T-Mobile would take the opportunity and give family-data options like they have family texting options. Cliq XT didn’t sell much but the highlight was popular. Slow starter when the Behold with 5mp camera w/ flash right next to it, but now that it’s gone people ask for it. Hmm… The AP article talks about the phones bejng locked to Family mobile only, so they can’t be used on typical T-Mobile plans… but it didn’t say the SIMs were… are they trying to be another Tracfone with this? This might be good for my fiancee and I if it allows for non-FM phones, as we spend $130 on our lines (MyFavs 300 w/ texting & data for her; 500 EM+ with data for me). The data part might be a kicker, but with both of us being addicted to certain phones that can’t use 3G… we might be able to buy up a couple GBs and have that spread a few months. T-Mobile has a product called Family Allowance that does this – not sure if it will be carried over to WallyWorld or not, but lets hope so. T-mobile has Family allowances that you can use to limit txt, minutes, purchases, as well as restrict numbers that can be called / txt.. I don’t know if that will work with this new walmart plan tho. With Walmart on board, T-Mobile really is officially the family carrier. Great for them, but I hope they expand in OTHER areas too. good for consumers without strong credit and good for TMO – a somewhat guaranteed recurring revenue stream. Good for all of us if it helps TMO stay afloat. Great customer service and the only other GSM carrier outside of AT&T. This looks like a way for Magenta to grab some cash. Maybe to fuel their merger with Sprint to possibly invest in Wimax development. Why would you ever, EVER, wish for T-Mobile to buy into WiMax? You’ve seriously got to be kidding me. VERY smart move on T-Mo’s part! 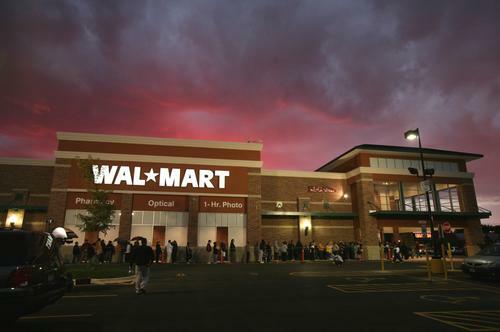 Wal-Mart is a forever-growing business that brings in people by the thousands to any merged companies. T-Mobile must have somebody new running the show this year.. Wonder what phones they are going to offer? The german government has investments into DT/T-Mobile, but I wouldn’t say the government would be “taking over” even if T-Mobile USA was number one here. Its like saying the canadian government is in control of the NHL because the Maple leads are owned by the Ontario Teachers Pension Plan. Walmart shoppers know what boiled peanuts are but internet on a phone ? The world must truly be full of snobs.So if you shop at wallmart your dumb realy. I RATHER PAY more on my monthly bill, as long as it means Sprint stays away. I never want T-Mobile to Merge with Sprint. Nor do I want the iPhone. At&t can keep the iPhone and that insanse cult leader Steve Jobs. I have a hard time believing all the talk about T-mobile going out of business or merging with another company with all the expanding they are doing. Although some don’t agree with the direction they are taking with catering to families, they are the only wireless network marketing to that market. I think if they keep going down this road of expansion, super phones, and great plans and options for families we will see T-mobile move up in the ranks of best wireless companies. Pretty smart move I think. Families are kind of a big thing you know, with all these human beings procreating and stuff. T-Mobile is hitting the right niche with this move and their kids are free program. Walmart has some pretty far reaching roots and a wide customer base. doesn’t this just mean now T-Mobile has another competitor? So what if Walmart is paying T-Mobile to “power” the network, doesn’t that still mean less people activating with T-Mobile? Your right it does seem like it will be a mild case of cannibalism but if you compare this to Tmobiles Even More Plus with no contract then this Walmart deal is just not worth it. This ONLY caters to people who want unlimited minutes with text. If you want a cheap plan with very little minutes then EMP is the way to go and the same goes for people who want DATA as well, you gotta be crazy to spend $40 on 1GB. In the end Walmart wont take too many people away from TMO but they will bring in some potential buyers and split the bill. I disagree to an extent. A family of 5 will get unlimited talk and text and 500mb of data with the Wal-Mart Family mobile plan for $145. EMP unlimited for a family of 5 costs $190 and thats not including any data. Family of 5 with unlimited data on the first two lines would be $230. So yeah, I think the Walmart plan is better in that scenario. If you slap 5 of walmarts rediculous $40/GB Limited data plan on all 5 of those lines then your looking at $345 for a unlim talk, text and a whopping 5GB of total Data where as on a real plan you can get unlim talk, text and completely limitless data consumption for $320. Lets add 2 of the (God I wanna call it unlimited but its only 1GB) $40 data plans to Walmarts deal and your paying $225. Who would actually only use 100MB of data nowadays? Especially since they are in #4 anyway, I don’t think T-Mobile cares about their number of subscribers, as long as the $$$ is going into their pocket. Plus it takes away a lot of overhead costs… activating costs, support costs of the customer, billing costs to get the money every month, etc. I wonder how many people who “hate T-Mobile” will wind up signing up with Walmart and effectively giving TMo their money anyway. Oh, the irony of the ignorant. Ahhhhhhhhh Yes! I will no longer have to tell those Flexpay No Contract customers that Wal-mart will not activate NO Contract. This is awesome! Can I assume that I could use my Vibrant with this service? and T-Mobile users, current and future ones. So the article reads that you can’t use a T-Mobile sim in one of the WM phones, but… Can you use a WM sim in any unlocked GSM device??? That’ll be huge IMO. Can’t wait for someone to try it out. T-mobile Germany has put in a lot of money on T-mobile USA and have not had much returns. It is thus likely that DT will want to make a good profit selling T-mobile USA. If they do sell, I would hope Google buys it (for sales advertising revenue) or Intel (to get in to the cell phone chip business so it can market its own cell phones). Anyone but AT&T and Sprint and Motorola. I have noticed European businesses have a higher ethical standards than US businesses due to a historical absence of regulation in the US. I don’t think T-mobile ethical standards and focus on customer service will stay too long after they are owned by some one like AT&T or Sprint. Man oh man are there some moronic comments in here. Anyway, as to this Wal-Mart deal, the important aspect of it is that in the U.S. the concept of no-contract cell phone plans is growing. Recall it was T-Mobile that came out with the Even More Plus plans (that I have). Now, T-Mobile is spreading the concept to Wal-Mart. Give it about three years, contracted cell plans will vanish. So too will credit checks and deposits. And people will get used to the concept of paying about $300 or less for top-end superphones. (And at that price they will keep them longer). The carriers make a bucket load of cash with subsidized phones (locking people into two-year, over-priced cell plans). People are wising up and for sure the majority of consumers, in this “depression” economy are no longer willing to pay $2,000+ for two years of phone service. Those of you who think this is not what’s happening, ask yourself why carriers are selling the hottest phones for $200. If the economy was even moderately good carriers would be selling subsidized phones for $300 to $350. But they can’t so they don’t. Also ask yourself why carriers are aggressively moving to “no credit check” plans. You think it might be it’s because millions of people now have lousy credit? Anyone want to venture a guess how many Wal-Mart shoppers are living paycheck to paycheck and have more than a few dings on their credit reports. T-Mobile is on to something here. (Actually, all its doing is importing the way it does business in Europe.) No contracts, end of subsidized phones, phones can be paid for over a couple years (that’s having the binding affect of a contract without having a cell plan contract), cheap family plans, etc. Shared data plan, finally. 1gb? ridiculous. Gimme at least 3gb for $50 or less and I’m on it tomorrow. A man once told me while I was trying to sell him a Cingular phone, 2003, that in the future there will be only three major Cellular Carriers in the United States. He said this with such conviction as if he was from the future or has phsycic powers. LOL… . I asked how he knew and he said he couldnt tell anyone without losing his head but did advise me to keep stock in Sprint, Verizon and T-mobile. I asked him if those were the three and he winked. Around a year later who merges? Cingular and AT&T then follows Sprint and Nextel. Who’s next??? just go to simple mobile its better it costs a little more but its worth it.